little*big*harvest: A Tale of Two Consumers: Halloween Fright...or Delight? A Tale of Two Consumers: Halloween Fright...or Delight? Both of the consumers in this little tale are me. It struck me, as I drove home Sunday evening with the smell of very ripe apples permeating the van and my youngest son singing softly in the backseat, that my weekend was split in two; each day had been spent consuming, but in ways distinctly unalike. Let's start with Saturday. We had been invited to an annual family Halloween party, and I grabbed Patrick (my eldest spawn) to head out to get some last minute things for the party. Our city has a couple seasonal Halloween stores, and Patrick was looking for a specific item. Since I really love Halloween, I was thrilled to be helping him with a costume, surprised that he was still even considering dressing up at almost 15 years old. We thought we'd just 'run out' for a minute, a quick in-and-out-and-back-home kind of thing. As we drove along one of the main thoroughfares in our city, It became apparent pretty quickly that everyone else in town had an afternoon shopping trip in mind. It's like everyone just suddenly crawled out of their front doors at the exact same moment, piled into their cars, and took off for the shopping hub together in one scary mass. The entire city appeared to be out. All of us, trapped in our cars, bumper to bumper, fighting for parking spots. I'm not much of a shopper as it is, so I panicked. My blood pressure spiked, I grew cranky and maybe even a bit rude; I said ugly things to Patrick and he retaliated like any normal teen. Our afternoon became terse, irritating, infuriating. I mentioned wanting to move to the country and never venture into any city ever again, while Patrick argued that he liked the craziness, he (unlike his weird and antisocial mother) liked people. I yelled back "I like people too, but this is not normal...how can you like this, this is consumerism at its worst!" You know, I used to like Halloween, a lot. It comes at my favorite time of the year; I love the colors, I love the grim and ghastly and the fun, and of course, the candy. Fall is when I truly feel alive, even if it means that much of the gardening season is past for the year. The cool crisp air is enough to make me sing out loud. But somewhere along the way--or maybe it's always been this way and I've never noticed--consumerism took over. The marketers of big businesses and makers-of-all-useless-junk got wind that I, along with most other people, really like the spirit of Halloween. Suddenly Halloween became extremely marketable, and the decorations began popping up in August. Halloween merchandise that we didn't even know we ever wanted or needed began showing up in droves. Why? Why ruin a perfectly good 'holiday' by ramming it down our throats? I feel like I've been duped, part of a consumer nightmare, and instead of enjoying a leisurely day with my son looking at costumes, we were fighting a mass of humanity who all seemed desperate for the perfect costume, accessories, decorations, and party favors. Why were we all doing this? When did we start craving useless Halloween gadgets, replacing staying at home making simple candied apples, sipping soup and reveling in fall's gorgeous beauty with heading to the nearest shopping mall to fulfill our consumerist needs? Why was I participating in this madness, anyway--wasn't the Christmas shopping I'd be fighting to finish in a few months time enough for the entire year? It was enough to make me want to turn around and head home immediately before even finding a parking spot. Despite the sluggish and desperate journey through two specialty Halloween stores, we didn't find what he was looking for. It turned into an exchange of words on 'why didn't either one of us look online before the last minute', and then a tirade from me about all the overpriced and cheap Halloween stuff that was more than likely made in China and would be destined for the landfill. Patrick and I were so tense and angry that I felt like I would scream. Three hours after we initially left the house, cheery and fresh, we pulled into the driveway, exhausted and angry at the world...and empty-handed. Patrick decided he didn't need to dress up this year, he was over it. A simple homemade costume would have sufficed, and we could have been inspired before leaving the house with a simple google search, but the mood was soured enough by the time we got home that Patrick didn't even want to consider it. I had missed an opportunity to make Halloween simple, and instead allowed myself to be swallowed into a dark pit of mindless consumerism, the suffocating atmosphere of overcrowded stores and rude shoppers. They wanted the perfect Halloween, as did we, but we were all looking in the wrong place. Part of me was sad, because I've always associated Halloween with not only the deep meaning of the fall season, but with enjoying my kids and making sure they got to dress up as whatever they desired. I always loved being caught up in the fun, but this shopping trip only made us angry and overwhelmed, the fun Halloween spirit gone. Entering our house was like a breath of fresh air, after spending three miserable hours in traffic and stores wanting to be anywhere else but in those crowded places. I'd compare everyone to zombies, but the pun feels too contrived. We had become an active part of the masses, contributing to the crowds, and I'm willing to bet that I was not the only one feeling panicked and claustrophobic and wondering "WHY am I even doing this?" We slowly became ourselves again, apologies were given, and our disappointment about all things Halloween surfaced. I looked around at all the cutesy decorations I like to put out, and remembered something my brother had said the week before. He'd noticed all the elaborate decorations (including full 'graveyards' in front yards and porches completely blocked off by giant 'spiderwebs') in my neighborhood and had said, "What is with some of your neighbors? I think people go nuts with decorations for Halloween anymore-- even more so than Christmas--it's crazy." Yeah, lots of people do go all out. I've always found it fun. But now I'm feeling a little jaded. I'm even feeling some desire to boycott the holiday, since every aspect of pumpkins and zombies and ghosts has been commercialized and marketed, and the sense of fun has been overpowered by the need to consume. The second half of my consumer tale takes a different direction. I'm still the main character, but the consuming was of a very different sort. Sunday was a fresh start, and the weather promised to be gorgeous. During the Halloween party the night before, Uncle Loren (my garden hero) had mentioned he had plenty of apples left if I needed them, and they might not last much longer. So this time I packed up my youngest spawn, Noah, along with some 5-gallon buckets, and headed out to my uncle's little homestead. Noah hung out with my parents, who live next door to Uncle Loren, and I got to work. I was ready to consume, only this time I was not mindless, nor was I fighting thousands of people for overpriced junk. I was ready to consume the offerings of the late fall harvest. The work was hard, as I dragged a ladder around and scouted out good remaining apples. I grew tired quickly, but instead of a headache and a hatred of the world, I fell into a peaceful pace of quiet meditation. The apples were free, and they would help us get through the winter once I sauced and dried them. No one in China had worked long hours--earning next to nothing-- to produce this for me, so that I could shell out big bucks for a fleeting material joy and then throw it in the landfill. These gifts came from nature, and from Uncle Loren, who tended the trees, and they would be consumed in the truest sense, providing for our bodies. I was able to also score a load of pears, a few green peppers that Aunt Jeanne had in her fridge from the last harvest, and so many sunflower seeds and marigold seeds I'll not have to buy any for next spring. I also grabbed a couple of birdhouse gourds, which will come in handy for a fun project with the kids. I picked quince for the first time, and hope to make jam from them. After awhile I joined my parents and Noah, who were outside in their yard picking up walnuts (a huge yearly job for my dad, who planted way too many black walnut trees when he built his house. Side note and topic for future blog: don't plant black walnut trees anywhere near a place you want to grow food. They are very detrimental to other plants). We all enjoyed each other. We smiled. The colors of fall were vivid, the air was fresh, we were firmly planted at home instead of on a desperate chase for useless Halloween goodies. Today is Halloween, and there is a huge thunderstorm predicted during the trick or treat hours. My younger boys have costumes planned out; Noah asked to be a ghost, which couldn't be easier to make from scratch, and Simon chose to be a ninja using the variety of dress-up clothes we've had for all the little ninjas around here for years. I am thrilled to not have purchased costumes. Or any new decorations, for that matter. However, with the possible thunderstorm, we may not trick or treat at all. Maybe the tradition of running around begging for candy needs to be reassessed anyway. Just saying that makes me take pause; no way could we boycott trick or treating...it would be cruel, right? Or am I just helping to create greedy consumers when we run from house to house wanting more, and more, and more--of candy and junk that is terrible for us anyway? Don't panic--I probably won't boycott trick or treating just yet. Early this morning Noah got up and said "it's Halloween! Can we go trick or treating?" I totally get that for kids, it's not just about the candy, it's about showing off the costume and seeing all the other scary, funny, weird, and interesting characters walking around. However, I'm already brainstorming other traditions for the boys to overshadow the blatant and soul-sucking consumer aspects of Halloween. We can make treats together at home, watch scary movies with popcorn, find ways to decorate without buying anything new (we have enough craft items in this house to supply an entire school). Yes, we can still dress up in fun costumes. There are things we can do together, focusing on the harvest of fall and the fun themes of Halloween that I really do still love. I can't help it, I love the images of ghosts and zombies and witches and goblins, pumpkins and mummies and bats. I love the history behind the varied traditions people have invented throughout time; from the ancient Druids marking the end of the 'season of the sun' and entering the 'season of darkness and cold', to Mexico's Days of the Dead, to the timeless celebration of Samhain--marking the end of the harvest season. Learning about the significance of this pivotal season throughout history is fascinating. Jenna Woginrich describes the Halloween sense of rest and reflection perfectly in her newest book Cold Antler Farm--she writes that all the intense work of the summer is over, the harvests are brought in, and we have a little more time on our hands. Extra time for our bodies to be more idle, and our minds to ponder and celebrate, to remember those who were once living and have passed on before us. Her beautiful book is worth reading for the Halloween chapter alone, as she described our innate need for Halloween in ways I never could. Now...all deeply meaningful history aside, I sheepishly admit--the preschool teacher in me loves the orange paper pumpkins and black bats with googly eyes, the ubiquitous lineup of paper ghosts on the wall, no matter how corny those modern symbols of Halloween may be. The opposite experiences of Saturday and Sunday gave me a new look at Halloween and autumn in general; and even though I think I'll always have a special place in my heart for Halloween, I realize I don't have to jump blindly into the trap of buying, using up, buying more. We can celebrate without purchasing. Decorations and costumes can be reused, borrowed, made from scratch. Now if I can keep this new attitude until the snow falls. Just last night I caught a glimpse of rows of very Christmasy -candy canes at Walgreens when I went to get a prescription for Craig. Bring it on. 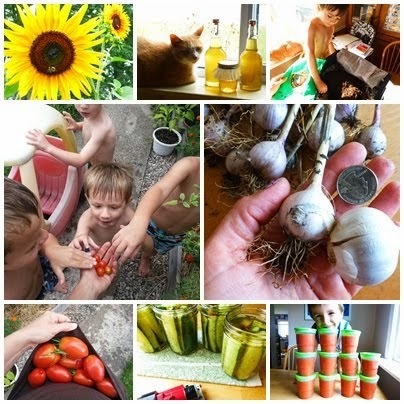 This consumer is leaning toward the homegrown, the homemade, the experiences of each and every season that cost very little and won't leave me feeling like a hateful...well, zombie. The author of this blog chose very interesting title for his post because we know that in halloween season people like to buy hallwoeen. With the help of this https://www.bestbritishwriter.com/britishessaywriters-co-uk-review/ blog we can read the amazing story of a tale of two consumers.